The problem with musical fads is that they can get old fast. As a genre gains more popularity, so more bands start to surface. The end result is one of saturation, too many bands plying their trade in a style that can become stale as quickly as it became exciting. The trick then is to discover the bands that are rising above the tide, those groups that are still managing to be exciting where their peers are failing to do so. 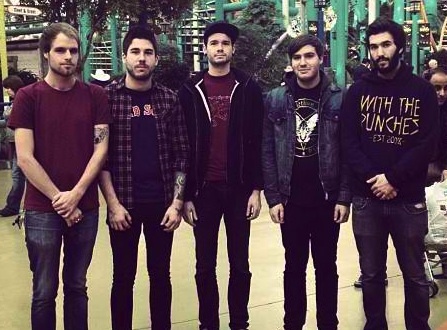 Bands like Real Friends. Amongst the spate of sub-standard pop-punk records this year, it has been easy to miss some real gems. The three EPs released by Real Friends this year deserve every bit of attention they've received, and then some. Dropped back in January, second EP "Everyone That Dragged You Here" is one of the strongest genre releases this year. Opener 'Floorboards' is a pop-punk tour-de-force. It's energetic, it's catchy, it's got all the right breaks in all the right places. It works acoustic. It's essentially the perfect opening to an EP. In May, the band released an accomplished acoustic EP, the one new song included showing that the possess song-writing skills away from the typical pop-punk fare showcased on ETDYH. This month, Real Friends have come out with "Three Songs About the Past Year of my Life," a new three track EP just as strong as "Everyone..." Middle track "Hebron" is an astonishing departure from their signature sound, as heartfelt and passionate in its delivery as it is disarmingly fierce. Vocalist Dan Lambton struggles to contain his emotion as a single guitar chimes in the background. It's painfully honest, impossible to be unaffected by, and brilliant. From repeated lyrics about sleepy eyes and boney knees to artwork featuring houses of the leafy Chicago streets the band call home, there is an ultra-personal aspect to Real Friends that instils a vitality to their songs. Theirs is the sound of pent-up small town frustration exploding from your speakers. For every "Floorboards", there is a "Hebron". For every "Anchor Down", a "Skeletons". Real Friends have shown, over three releases in one year, that they are a multi-faceted, excitingly talented pop-punk band that have distilled exactly what it is that makes the genre so great. Fans of pop-punk, you owe it to yourselves to give these guys a spin. With the continued rise of The Story So Far, Real Friends may be the next to capture audiences' attention. Check out Real Friends on Facebook, Twitter and Bandcamp.